July 22 is National Penuche Fudge Day in the United States. Penuche is a type of fudge made with butter, milk, and brown sugar and flavored with vanilla. It has a lighter texture than regular fudge and often has a tannish color due to the caramelization of brown sugar. Penuche is popular mainly in New England and some places in the American South, though in the latter it is usually referred to as brown sugar fudge candy. It is also known in Hawaii as panocha or panuche. A similar confection is traditionally prepared in Québec during the winter holiday season. It is called sucre à la crème. 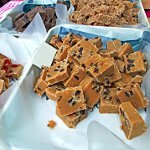 Penuche fudge is usually prepared in the following way. The mixture of brown sugar, butter, and milk is heated to the soft ball stage and set aside to cool. When the mixture is lukewarm, flavorings (for instance, nuts, vanilla, or maple syrup) are added. The mixture is beaten until thick and poured into a pan. Penuche is cooled and cut into pieces before serving. Penuche is never flavored with chocolate or any other strong flavorings. Brown sugar is the key to its unique flavor reminiscent of caramel. Nuts (for example, pecans) are added for texture but not for flavor. To celebrate National Penuche Fudge Day, treat yourself to this New England favorite.